Just like in the NHL, the OHL annually recognizes the best of the best from the past season in naming its three All-Star and two All-Rookie Teams. The young men on these list exemplified everything that the league has to offer and they are very deserving of the accolades that they have been given. The OHL has not had its All-Star Classic in the last two seasons so it is quite nice to know that the naming of these teams has remained intact. There are some players who could have been considered for each of these lists but, for unknown reasons, they were omitted. Nevertheless, these classifications are true honours and they should not go unrecognized. Michael Sgarbossa led the OHL in scoring with 102 points in 66 games. His 47 goals were second-best in the league and his 55 assists were tied for third-best. He led the OHL with 18 powerplay goals and his four shorthanded goals tied him with Mathew Campagna for the Wolves’ team lead. He was also second on the Wolves with a +21 ranking. A third-round pick of the Barrie Colts in 2008, Sgarbossa signed an entry-level contract as an undrafted free agent with the San Jose Sharks in 2011 but his rights were traded to the Colorado Avalanche at the 2012 NHL trade deadline. Brandon Saad was 18th in OHL scoring with 76 points in only 44 games after returning to Saginaw from the Chicago Blackhawks. He tied for second on the Spirit in scoring with Nashville Predators draft pick Josh Shalla. His 34 goals were second on the team and his 42 assists were third-best. Saad led the Spirit with a +35 ranking, a plus/minus that was tied for third-best in the entire OHL. A first-round pick of Saginaw in 2008, Saad was also the recipient of the William Hanley Trophy in 2012, an award given to the OHL’s most sportsmanlike player. Tyler Toffoli was second in OHL scoring with 100 points in 65 games. It was his second consecutive season of 100 or more points. His 52 goals led the entire league and, yet again, he led the Ottawa 67’s in scoring. Toffoli scored eight powerplay goals and seven shorthanded goals, the latter tying him for second in the OHL. His +31 ranking was second only to Shane Prince (+35) for the best plus/minus on the team. A first-round pick of the 67’s in 2008, Toffoli, a 2010 second-round pick of the Los Angeles Kings, also won his second straight Jim Mahon Memorial Trophy in 2012. Dougie Hamilton led all OHL defencemen in scoring with 72 points in only 50 games. His 17 goals tied him for second among all OHL blueliners and his 55 assists led every defenceman. In fact, his assist total was third best in the OHL in 2011-12. Hamilton led all blueliners with nine powerplay goals. He also tied for second on the IceDogs in plus/minus with a ranking of +37. A second-round pick of Niagara in 2009, the 2011 first-round pick of the Boston Bruins won the Max Kaminsky Trophy as the OHL’s best defenceman this year, his third major award and first non-academic award. Scott Harrington had 26 points in only 44 games in 2011-12 but it was the elevation of his play this past season that warrants his selection as a first team All-Star. Alongside Jarred Tinordi, Harrington became a defensive stalwart on the blueline for the London Knights, playing up to 20 minutes a night. He also scored two of his three goals in 2011-12 on the powerplay. The Pittsburgh Penguins draft pick, who was the first-round pick of the Knights in 2009, had an impressive +26 ranking, despite missing time with Team Canada at the World Juniors, winning a bronze medal for his country. Michael Houser was the busiest goaltender in the OHL during the 2011-12 season and he led the league with 46 wins in 62 games. He recorded a decision in every game he played. Houser’s 2.47 goals-against average was third-best in the OHL and his .925% save percentage was fourth. He was second in the OHL with six shutouts. He also led the league with 1862 saves and 3698 minutes played. Undrafted to both the OHL and the NHL, Houser won both the OHL Goaltender of the Year award and Red Tilson Trophy for the most outstanding player. He also helped London win the OHL championship. Sean Monahan was 16th in the OHL, and third on the Ottawa 67’s, in scoring with 78 points in 62 games. Both his 33 goals and his 45 assists were third-best in Ottawa. Monahan, who scored 20 goals as a rookie, led the 67’s with 10 powerplay goals, which tied him for seventh in the OHL. The 2010 first-round pick of the Ottawa 67’s, who is ineligible to be drafted to the NHL until 2013, also had the fourth-best plus/minus on his team, registering a +25 ranking. He has won gold medals at the 2010 World Under-17s, in which he scored the winning goal, and the 2011 Ivan Hlinka Memorial Tournament. Tanner Pearson was third in the OHL in scoring with 91 points in 60 games after he led the league in scoring for the majority of the campaign. A 14th-round pick of the Barrie Colts in 2008, Pearson had the fourth-best assist total in the OHL in 2011-12 with 54. His ten powerplay goals were third-best on the Colts and his +21 ranking was tied for first. Pearson missed some time with Team Canada at the World Juniors and his stellar play this past season has him highly ranked for the 2012 NHL Entry Draft, despite slipping through in each of the last two years. 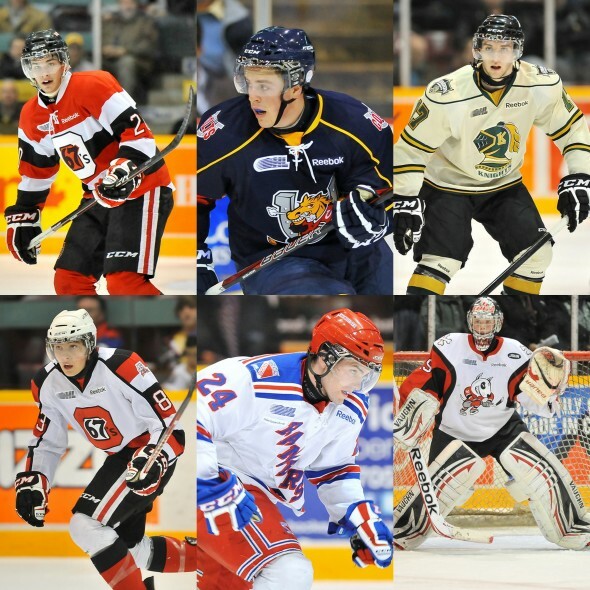 Seth Griffith finished tied for eighth in OHL scoring with 85 points in 68 games. Griffith, who was unpicked in the 2011 NHL Entry Draft, led the London Knights in almost every statistical category in 2011-12. The only statistics he did not lead them in were assists, where he was fourth, and plus/minus, where he was second. His 15 powerplay goals and seven shorthanded goals were both tied for second best in the OHL. A fourth-round pick in the 2009 OHL Priority Selection, Griffith also scored the J. Ross Robertson Cup-winning goal for London this year. Cody Ceci finished second among all OHL defencemen in scoring with 60 points in 64 games. His 17 goals were tied with Dougie Hamilton for second-best among all OHL blueliners. Ceci’s 43 assists were also tied for second among all OHL defencemen. The first-round pick of Ottawa in 2009, who is eligible for the 2012 NHL Entry Draft due to a late birthdate, finished fourth on the 67’s in scoring. His +21 ranking was second only to Marc Zanetti for the best on the team’s defence corps, as well as fifth-best on the 67’s overall. Ryan Murphy was tied for third among all OHL defencemen in scoring with 54 points in 49 games, all the while missing time with a concussion. His 15 goals were fourth best among all blueliners and his 43 assists were tied for second most. Murphy, who was the first round pick of the Carolina Hurricanes in 2011, was fourth on the Rangers in scoring during the 2011-12 season and tops among Kitchener defencemen. The Rangers’ first round pick in 2009 scored five shorthanded goals and he also tallied 22 points en route to leading Kitchener to the OHL Western Conference finals. Mark Visentin may have missed time with injury and Team Canada duty in 2011-12 but he still managed to set a new OHL record with ten shutouts during a season, giving him an OHL-best and IceDogs team record 1.99 goals-against average. The Phoenix Coyotes 2010 first-round pick, who was the IceDogs’ third round pick in the 2008 OHL Priority Selection, may not have been able to win his second consecutive OHL goaltender of the year award but he did help win the Dave Pinkney Trophy for OHL lowest team goals against. Visentin’s .926% save percentage was third best in the OHL. He also became the second goalie to score a goal in the OHL playoffs in 2012 with an empty netter against Ottawa. Alex Friesen finished 26th in the OHL in scoring with 71 points in 62 games. The 2010 sixth-round pick of the Vancouver Canucks, who just completed his overage OHL season, was fourth on the IceDogs in scoring in 2011-12. His 45 assists were also fourth-best in Niagara. Despite leading the team with 106 penalty minutes, Friesen, a second-round pick of the IceDogs in 2007, also led the team with a +39 ranking. His nine powerplay goals and three shorthanded goals were both tied for third. Friesen finished his OHL career with 244 points and 381 penalty minutes in 292 career games. Andrew Agozzino finished fifth in the OHL in scoring with 88 points in 67 games. The first draft pick in Niagara IceDogs franchise history, he ended his OHL career as the team’s all-time leading goal scorer; as well, he finished his third season as team captain. Agozzino won the Leo Lalonde Memorial Award as the OHL’s top overage player and the Mickey Renaud Captain’s Trophy this past season. He also led the IceDogs with 13 powerplay goals and seven shorthanded goals; his +32 was also the third-best plus/minus on the team. Nail Yakupov was 30th in OHL scoring with 69 points in 42 games, missing time with injuries and World Junior commitments, helping Russia win silver at the 2012 tournament. 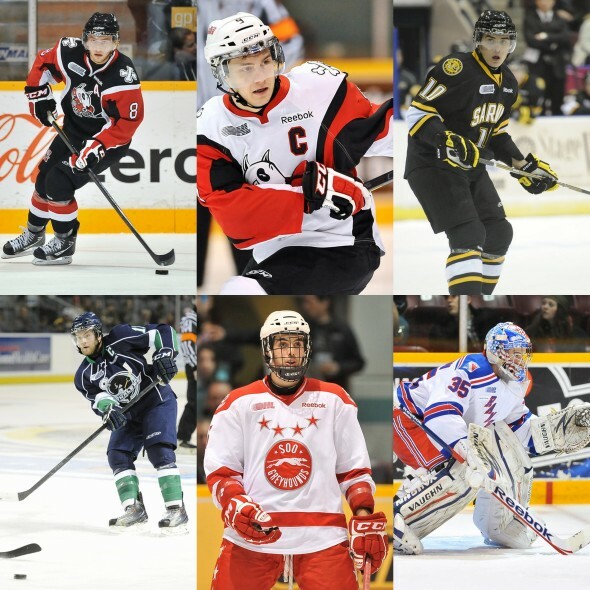 Yakupov, the 2011 OHL and CHL top rookie, was third on the Sarnia Sting in scoring. His 31 goals were second best on the team and his 38 assists were tied for second. Yakupov led the Sting with 12 powerplay goals and with a +15 plus/minus ranking. He was also named the OHL’s top prospect for the 2012 NHL Entry Draft, despite not playing at the Top Prospects Game in Kelowna. Beau Schmitz was tied for third among all OHL defencemen in scoring with 54 points in 62 games. The Plymouth Whalers captain, who was the team’s first-round pick in 2007, was seventh overall on the Whalers in scoring in 2011-12. His 14 goals were fourth-best among OHL blueliners. Nine of those goals were scored on the powerplay. Schmitz’s 40 assists were third-best among league defencemen. After the 2011-12 OHL season ended, Schmitz was signed to a three-year, free agent entry level contract by the Carolina Hurricanes. Ryan Sproul was tied with Beau Schmitz and Ryan Murphy among all OHL defencemen with 54 points in 61 games. The Detroit Red Wings 2011 draft pick, who was the Sault Ste. Marie Greyhounds’ sixth round choice in the 2009 OHL Priority Selection, led all league blueliners with 23 goals. His +16 ranking was the best plus/minus on the Greyhounds in 2011-12. Sproul’s goal totals were third best on the team; so were both his 31 assists and eight powerplay goals. In addition, his two shorthanded goals were best on the Greyhounds, which is impressive since the team as a whole scored only five. John Gibson joined the Kitchener Rangers after winning both the 2011 World Under-18s for the United States and being chosen in the second round of the 2011 NHL Entry Draft by the Anaheim Ducks. Gibson opted out of playing for the University of Michigan to play in Kitchener and the decision was a good one. His 2.75 goals-against average in 32 games was seventh-best among OHL goaltenders and he led them all with an impressive .928% save percentage. The Pennsylvania native managed to put up 21 wins and a shutout splitting the netminding duties with Franky Palazzese and Jack Moylan. Radek Faksa, the 22nd overall pick in the 2011 CHL Import Draft, was 40th in the OHL in scoring with 66 points in 62 games, tops among all rookies. His 29 goals and 37 assists were both best among all league rookies, too. He finished third on the Rangers in scoring and his goal totals were second only to Kitchener’s other import player, Tobias Rieder. To add, Faksa finished tied for third on the team with eight powerplay goals and tied for second with two shorthanded goals. The Czech Republic native, who was the runner-up for OHL rookie of the year, is a highly ranked prospect for the 2012 NHL Entry Draft. Nicholas Ritchie was sixth among all OHL rookies in scoring with 39 points in 62 games. The younger brother of Niagara IceDogs forward and Dallas Stars prospect Brett Ritchie, the 2011 first-round pick of the Peterborough Petes was fifth in team scoring despite missing time with Team Ontario at the World Under-17 Hockey Challenge. Ritchie’s 16 goals were tied for seventh among all league rookies and his 23 assists were sixth best. He actually scored ten more points than his brother did in his OHL rookie season and in three fewer games. Connor Brown was second among all OHL rookies in scoring with 53 points in 68 games. Brown’s 25 goals were second-best among rookies and his 28 assists were tied for second. He was second on the Erie Otters in scoring but he led the team in points among players who spent the entire season with the team. (Dane Fox, who led the Otters in scoring, came over in a trade from London.) Brown led the Otters with 12 powerplay goals and he scored one of the team’s four shorthanded goals. A 1994-born forward, Brown is eligible for the 2012 NHL Entry Draft. 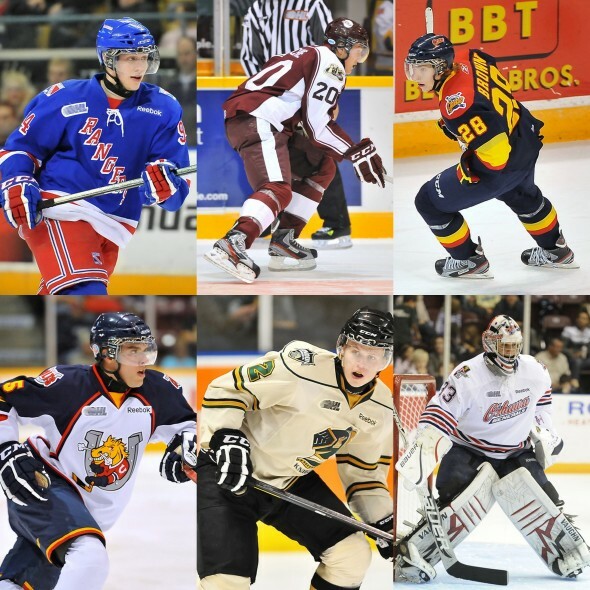 Aaron Ekblad was 19th among all OHL rookies in scoring with 29 points in 63 games. The 1996-born exceptional player was also second among all OHL rookie defencemen in scoring. His ten goals were tops among all league rookie blueliners and Colts team blueliners. He was eighth in team scoring in Barrie this past season. Ekblad won the Emms Family Award as the OHL’s top rookie and he also won gold at the World Under-17 Hockey Challenge for Team Ontario alongside many of his fellow OHL first-year players. Olli Määttä, who was the first overall pick in the 2011 CHL Import Draft, was 16th among all OHL rookies in scoring with 32 points in 58 games, despite missing time with injury and representing Finland at the World Juniors. The 2012 NHL Entry Draft hopeful had an impressive +26 plus/minus ranking, tops among Knights rookies. Määttä led the Knights’ defence corps in scoring, as well. Daniel Altshuller was one of only two actual rookie goaltenders in the OHL in 2011-12. He split most of the goaltending duties with Kevin Bailie during the 2011-12 season after the Oshawa Generals acquired his rights from the Belleville Bulls during the 2011 offseason. Altshuller’s 3.55 goals-against average in 30 games helped him win the F.W. “Dinty” Moore Trophy in 2012, which is given to the OHL rookie goaltender with the best goals-against average. His .900% save percentage was 16th best. Altshuller is one of the OHL’s top ranked goaltenders for the 2012 NHL Entry Draft. 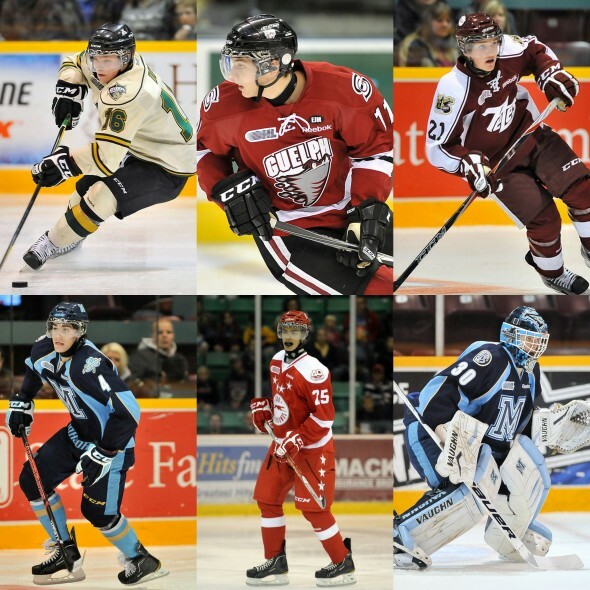 Max Domi was third among all OHL rookies in scoring with 49 points in 62 games. His 21 goals were fifth-best among league rookies and his 28 assists tied him with Connor Brown for second among first-year players. Domi, who had been traded to the London Knights from the Kingston Frontenacs before the 2011-12 season began, got a hat trick in his first OHL career game. He finished sixth in Knights team scoring overall. His +13 plus/minus actually had him in the middle of the pack on his team. Domi also managed to score six powerplay goals. He also got to win an OHL championship. Jason Dickinson, who was the Guelph Storm’s second-round pick in the 2011 OHL Priority Selection, finished 13th among all OHL rookies in scoring with 35 points in 63 games. He was second in team rookie scoring behind Hunter Garlent, who had 42 points in 60 games. Dickinson finished ninth on the Storm in scoring. Remarkably, Dickinson’s six powerplay goals, which led all team rookies, put him in a four-way tie for third in that category in Guelph this past season. Stephen Nosad was 15th among all OHL rookies in scoring with 32 points in 62 games. The second of two second-round picks of the Peterborough Petes in the 2011 OHL Priority Selection, Nosad finished seventh on the Petes in scoring in 2011-12, second highest among rookies. He may have only scored seven goals during the season but he did manage to score one of the Petes’ seven shorthanded goals in 2011-12. Trevor Carrick, the third brother in his family to play in the OHL, finished 33rd in OHL rookie scoring with 19 points in 68 games. Remarkably, though, he was fifth among OHL rookie defencemen in scoring. Carrick was eighth on the Mississauga St. Michael’s Majors in team points, finishing second only to Sergey Kuptsov in team rookie scoring and second only to Stuart Percy in team blueline scoring. Carrick actually had one more goal than Percy in twice as many games. He also tied Kuptsov for the most rookie assists in 2011-12 with 13. The Majors’ fifth-round pick in the 2010 OHL Priority Selection, Carrick is hoping to join his brother Sam and his cousin Bobby Hughes by being chosen in the NHL Entry Draft. Darnell Nurse, the third overall pick in the 2011 OHL Priority Selection, was 60th among all OHL rookies in scoring. The young man known colloquially as “Doc” had ten points in 53 games, missing significant time with a shoulder injury that kept him out of action for over a month between December 2011 and January 2012. In fact, Nurse did not score his first OHL career goal until March 10, 2012, against the Saginaw Spirit, the fourth-last game of the year. Nurse’s progress is much like that of teammate Gianluca Curcuruto, and the Greyhounds are being very patient with him (if you pardon the unintended pun). Spencer Martin, the first-round pick of the Mississauga St. Michael’s Majors in 2011, was one of only a select few actual rookie goaltenders in the OHL in 2011-12. With the OHL’s age limit rule barring many other first-year netminders from being selected for the all-rookie teams, it seems only fair that Martin would be chosen. He had a respectable 2-7-1 record in 15 games, registering a 3.98 goals-against average and an .885% save percentage. This is all despite spending a lot of time in the backup role to both JP Anderson and Brandon Maxwell. Martin’s two wins came on October 12, 2011, against the Erie Otters, and October 21, 2011, against the Sudbury Wolves. 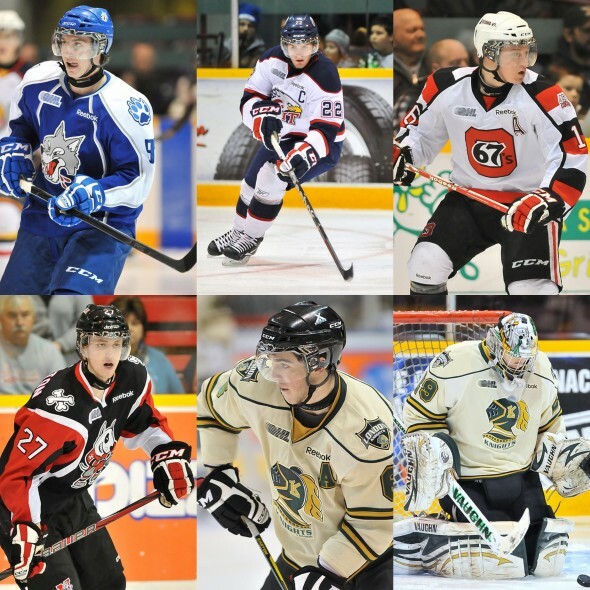 For more OHL and international hockey stories, please feel free to give me a follow on Twitter: @MargannLaurissa.